Hi, do you have measurement to show that using 2-Point HDR10 RGB balance from service menu provide better color accurancy from 20-Point HDR10 RGB balance with saturation and colorchecker? I don't have my before measuremenst because I did them so long ago. I just remember trying to adjust the upper portions of the grayscale with the HDR 20 points and remember the controls from different values affecting each other. Similar to the way my old 55EA9800 would displace if the contrast was not set to clip wtw. Also on this run I didn't do color checker or saturation sweeps so there very well could be adverse effect to those measurements but I'd have to run that to fine out. Hopefully in the next week I'll be able to run those measurements are report back with the grayscale. It will be interesing to post results comparing 2-point vs. 20-point calibration. To validate color performance you have to measure taking gamut measurements. 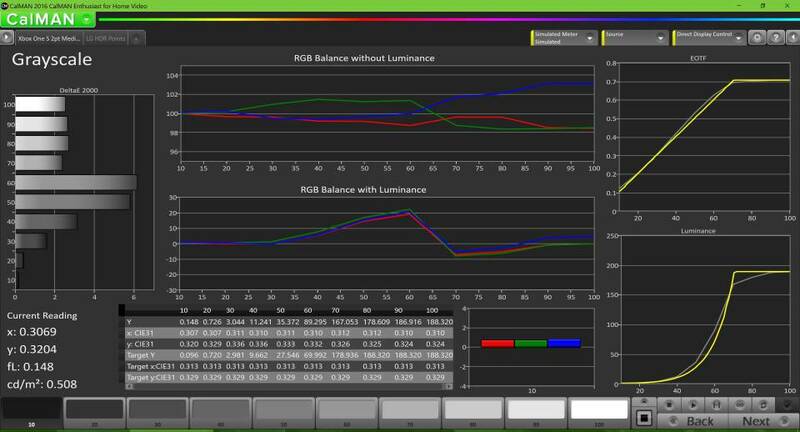 With grayscale you checking only the PQ transfer function tracking and RGB balance, no info about any color performance. (which can be super in-accurate). 2-Point works when you have a super linear display, with LG's at each step you need different RGB balance correction, it's not having the same amount of errors per color channel to the whole grayscale range, with 20-point you will have better results but it takes much more time because controls are not working very good and measurements of 21-Point are not enough...you need at least 33-Point grayscale or more to see what that happening. This goes for the 2017 models right? The 2017 models have the HDR 2pt controls in the regular menu system, so this is really only required for the 2016 models. This first pics is untouched 20p CV and untouched in service menu,so it will be an Before/after meassurement. You can use the medium color temp for HDR and then adjust the medium 2pt white balance in the service menu for HDR. Found it,was in the wrong menu (in-start instead of ez-adjust). Last edited by T( )( )L; 10-04-2017 at 10:11 PM. 2 Point done in service menu,heck even the greyramp looks good fine tuning to go. Some more meassurements,picture looks darn good and greyramp is ok. So when calibrating HDR Standard you just set Color Temp to Medium? And then when using the 2pt controls in the service menu the adjustments will apply to ALL picture modes using Medium color temp? So as long as my SDR calibrations are using Warm 2 for example this won't affect those calibrations at all? Yes select medium in white balance menu,then go into service menu and make sure you select medium there as well,i could chose between cool,medium,warm so use medium there as well,didnt have any impact of my other sdr calibrations. Have you verified using the 2pt controls doesn't raise the black floor? My set is one of the ones where I need to have 2pt Low around -15 for RGB to get absolute black (even with Brightness at default of 50) for SDR. Is Cut the low end and Gain the high end? On which ire have you made the 2p? I run 0-100 5% steps,there probably will be a red bump at 65-70 but continue to lower red and it will go away,you shouldnt need to do finetuning in 20p over CV 575. So just did a calibration run doing this and it measures great and looks great for reference images...but I have a really had red push after 70%. It's obvious if I put up a White Clipping pattern. I think it's because I used 60% to base the Gain settings off of? As far as the Cut controls go, they work for me if I do not raise them at all. Even raising blue from 64 to 65 caused black glow. Any picture of the cal chart,what happens if you continue to lower red? Going to redo it using actual 10% steps from 10-100. Other than my folly, this method is phenomenal! Hello. B6 owner and fanboy (fanman? lol) here. I dont think adjusting the cutoff's down will raise black and the gain shouldn't interact (but may be different in practice) so should be ok.
Side note: I also own an older LG lcd and an even older LG plasma and have been in the lg service menu quite a few times. On my plasma I read somewhere to never touch the cuts in sm 2pt and that I should calibrate to d65 on warm1 (w30) then copy the numbers to med (0) and cold (c30) to stabilize the panel. I have always wondered if there was difference between 2pt settings with relative values (starts at 0, with 20 or 30 clicks either direction) and 2pt with absolute values (like in sm where cuts are R-64 G-64 B-64 or sub b/c b-128 c-128)? Like does one operate in analog and the other in digital or? I'm hoping to do this 2pt white balance on medium in the service menu soon. For those of you who've done it, if you select medium for color temp on your Dolby Vision movies, do you notice an improvement there too? Does the HDR calibration carry over to DV? Also, I had already changed subB to 127 in the service menu to help with my SDR calibration/black level but I've heard that brightness shouldn't be touched at all for HDR. So now I'm wondering, should I switch that subB back to 128 before HDR calibration? That would mean having to switch back from 127 to 128 before any HDR viewing, which is sort of annoying. Thoughts? So here's where I am at using just the 2pt controls. For some reason the normal 20pt controls are very very sensitive (one or two clicks results in visible changes on grayscale ramp). I'm torn between focusing on getting 0-69% perfect at the expense of more error above 70% or leaving it how it is to have the entire grayscale "close". Only because under normal content the LG is only capable of displaying up to 69% or so, right? And the rest is tone mapped? Thoughts on worrying about 70% and above? Last edited by BigCoolJesus; 10-08-2017 at 08:00 PM. Seems you are not in HDR mode only 188 Nits,check your settings. It's in HDR. The Target Y is being displayed in fL but 100% reads at 640 nits or so. fL : ) well that fooled me,i do belive you could get better balance in 2 point then you dont need to touch 20p so much,check post #37 thats only done with 2p.